At least half the wild birds trapped by traffickers die during the capture struggle and transportation to points of sale. If you do not report the individuals engaged in these types of activities you automatically become accomplice to their crimes. Report them to the appropriate authority. In Mexico you can use the Procuraduría Federal de Protección al Ambiente (PROFEPA) website. Supply will exist while demand exists, this is inevitable. If you wish to have birds as pets, you should make sure they are born and bred in legally-operating aviaries; demand to see official proving documents. You should preferably buy couples, since solitude may cause serious emotional disorders and even death to these animals. Consider that birds require broad spaces to be able to fly and shelter from the inclemency of the weather. Make sure and expert shows you how to take good care of them. If you cannot provide adequate care, please do not buy them. 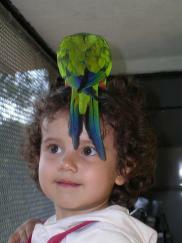 DO NOT BUY MEXICAN PARROTS. This is a major offense. The most serious threat to birds is the destruction of their habitat. If besides the foregoing, you take part in environmental campaigns by organizations like Greenpeace, for instance, you will be helping combat the problem from a wholesome perspective. Protecting the woods and forests with a culture that encourage respect for the environment and a sustainable use of natural resources it the only way to save endangered species and their ecosystems from doom. TXORI Ornithological Foundation maintains research and conservation programs thanks to the contributions of people interested in preserving endangered species. Join our project now and become a volunteer and/or donor.